With the help of our modern manufacturing facilities, We manufacture Industrial Aluminium Forgings, closed die forgings in the weight range of 10 gms to 5.0 kgs as per customers specification & our products confirm to American, Japanese, German, British & Indian standards. Our collection is appreciated for its attributes such as corrosion resistance, increased tool life, high density and others. 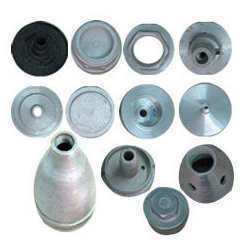 These are made with good quality aluminum and are widely demanded in various industries. We provide an assortment of Aluminum Forgings for Industries such as Defence & Railway, which is well known for its features such as tensile strength, corrosion resistance, light weight and others. These Aluminium Forged Parts are demanded in the application areas including defense and railway. We manufacture aluminum forgings in the weight range of 10 gms to 5.0 kgs as per customers specification. Looking for Industrial Aluminium Forgings ?